The Barry family replace their formerly living pet with a new dog. They make the worse possible choice when they pick up a German Shepard puppy from some people who aren’t Satanic cultists, and totally didn’t just sell them an evil possessed dog. Once the dog is brought in the house, strange accidents began to happen, and soon enough, Mike Barry (Richard Crenna) suspects his new pet is a force of evil. While he flies off to Ecuador to confirm his suspicions, his family is slowly being transformed into a coven of devil worshipers. monster to something truly evil, and it helps alleviate some of the inherent silliness of a Satanic cult of puppy sellers. You can also attribute some of this more intelligent approach to the popularity of The Exorcist (1973), and a rise of interest in the occult in popular culture. "Aww ma, we want to go do evil..."
Devil Dog still has it’s share of pulpy pleasures, especially during the finale, when Mike Barry faces off against his pet in it’s true form: a giant horned Rottweiler complete with a lizard frill. The closest the film ever comes to outright visceral horror is a scene of the devil dog trying to influence Mike to put his hand into the spinning blade of a lawn mower. Even with the knowledge that this a TV movie and it probably isn’t going to go as far as it could, it still adds a little excitement to the proceedings. Iit isn’t the most dynamic looking film, but Shriek Show’s Blu-ray shows off a crisp image. 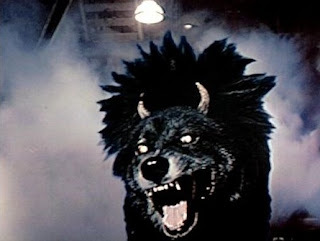 There aren’t a vast number of special effects, aside from a few moments of glowing eyes, and the devil dog’s monstrous form which isn’t wholly successful, but it works better than you would expect. The lo-fi quality of the effects give those last few moments a surreal edge that work in its favor. Richard Crenna and Yvette Mimieux are reliable actors and they sell their plight well. Its always dicey when younger actors are in the mix, but Ike Eisenmann and Kim Richards are fine in their roles, if never especially engaging, this might be due to the fact that they are supposed to be acting strangely thanks to the influence of the dog, but it’s difficult to say. Ok, who mentioned going for a walk? 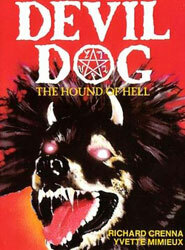 Devil Dog: The Hound of Hell is a clever little film that tackles a pretty silly premise and manages to extract something decent despite some (or maybe due to its) limitations. A lot of it seems very quaint now, but I could imagine this being a good nightmare inducing ninety minutes (plus commercials) for someone sitting down in 1978 to find out exactly what the heck a devil dog is supposed to be.